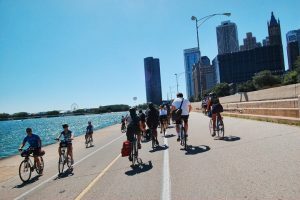 Active Trans shares regular updates on Chicago’s Lakefront Trail conditions as a service to thousands of daily trail users. Our updates cover trail conditions, events and activities that impact the trail, detours and trail-related news. We gather our information from our staff, partners and everyday trail users. Via Twitter: @activetransLFT or view the feed below. Report Lakefront Trail conditions via Twitter with the hashtag #CHILFT. We rebroadcast some of these reports through our @activetransLFT account. If you don’t have Twitter, you can email lakefront@activetrans.org with reports. Reporting etiquette In order to keep this information highly useful for trail users, please use the #CHILFT hashtag to report specific, objective information, including ice on the trail, crashes or other incidents, temporary access issues, traffic and high waves. If you have a more significant issue or a complaint regarding the trail, please contact lakefront@activetrans.org.